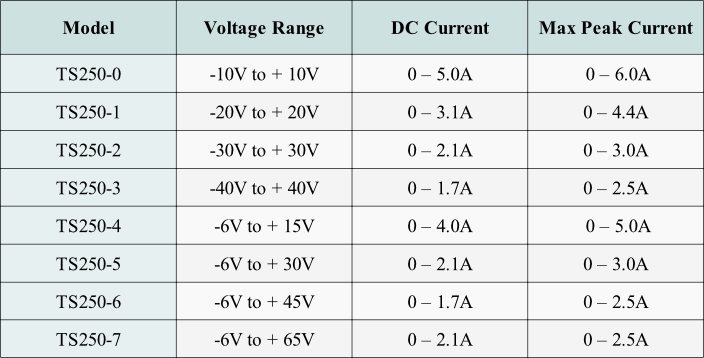 The TS250 outputs very high current from 1.7A to 6A, depends on the model (see Table 1 below). However, in some test and measurement applications, even higher current is needed. To further increase the output current, two TS250 High-Current Waveform Amplifiers can be connected in parallel as shown in Figure 1 above. Each TS250 amplifier must isolate their outputs from one other with a small resistance resistor. The isolation resistors are connected to the positive terminals. The TS250 negative terminals connected together and to the load negative terminal. Figure 1. Connect two TS250 high-current amplifiers to obtain even higher current. The isolation resistance should be chosen as large as needed, but not too large to cause excess voltage drop. The resistance is chosen so that at peak TS250 output current, it will cause a voltage drop of 0.5V. For example, if the peak current from each TS250 is 2.5A, the resistance should be as least 200mOhm. It is recommended to chose as large resistance possible and still have enough headroom. For example, in a given test application the unit-under-test required a maximum voltage of 17V and 3A. The TS250-1 (+/-20V) is chosen. The headroom is 3V, calculated by 20V-17V = 3V. Since the peak current is 3A, 1 ohm isolation resistors can be used. 3V/3A = 1 Ohm. At high current, the resistors will dissipate large amount of power. These resistors may get hot. The resistor must be chosen to dissipate the rated power. The power dissipation is calculated by the RMS current square multiply by the resistance. For high frequency testing, the series resistors should be non-inductive design to reduce the overall inductance. Since the resistors may be hot, avoid touch the resistors. The TS250 input is designed to interface with common function generators. Special connection is needed for connecting two TS250 high-current amplifiers. 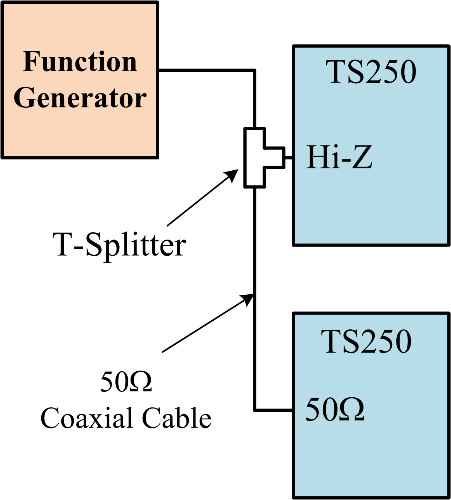 As shown in figure 2, it is recommended to connect the function generator to the two TS250 using a BNC T-splitter. The first TS250 input is set to “Hi-Z” or high impedance. The second TS250 is set to “50Ω”. This will properly terminate the signal to minimize reflection. All connection are using 50-ohm coaxial cables with BNC connectors. Using as short coaxial cable as possible. Figure 2. Serially connecting the function generator to two TS250.